Aerial photography in Canada began when the Air Board organized the first experimental flight over Ottawa in 1920. Although revolutionary at the time, the practice quickly became the most effective method of topographical surveying. That decade, flying boats traversed the nation to gather the first accurate measurements of the country’s size and to provide details of its entire landscape. Aerial photography continues to play a supporting role for organizations developing Canada’s infrastructure. Aerial photography in Canada began when the Air Board organized the first experimental flight over Ottawa in 1920. The Canadian industry expanded dramatically after the Second World War when operators including Kenting and Spartan used exotic high-performance aircraft, such as Lockheed P-38 Lightnings and de Havilland DH-98 Mosquitos, to photograph vast remote regions of the country. Some 95 years after it was introduced, aerial photography continues to play a supporting role for organizations developing Canada’s infrastructure and monitoring its natural resources and environment. Today, only a handful of Canadian companies specialize in providing “eyes in the skies” for public and private sector organizations. One of them, The Airborne Sensing Corporation of Toronto, is in its 37th year of operation. In 1980, Alex Giannelia was a young member of the Ontario Ministry of Natural Resources’ forestry department. Having spent almost four years there without any formal education related to trees, he realized that his career advancement prospects might be limited. Equipped with a thorough knowledge of photography, he saw an opportunity to assist the forestry industry through the provision of aerial photography. On April 1, 1980 he established Airborne Sensing as a sole proprietorship. Spotting a niche market for colour/infrared imaging, he approached forest products companies. Upon winning his first contract, he mortgaged his house and bought his first airplane in May 1981. “C-GERX” was a 1960 Piper PA-23-160 Apache G. He then equipped it with a military surplus Fairchild K-17 colour/infrared camera, that he had purchased for about $5,000 – about a 95 per cent discount from the price of a new one. Not long after, three of the Canadian industry’s largest players (Capital Air Surveys of Pembroke, Northway-Gestalt of Toronto and Kenting Earth Sciences of Ottawa) either downsized or shut down. Aided by the economic downturn at that time, he was also able to lease a mapping camera and was now suitably equipped. Later that decade, the company developed an in-house ability to process colour prints of aerial photographs. It meant working with rolls of 9-inch by 9-inch film that were up to 500 feet in length. Given its expanded capabilities, the tiny firm was permitted to bid on government contracts thereby significantly increasing its target market. During the 1990s, aerial photography became more sophisticated with the development of forward motion compensation (FMC) technology and Kinematic GPS-assisted surveys using the global positioning system (GPS). The industry’s transition from film to digital technology took place soon after. This meant that clearer images with greater location details could be produced faster and at a lower material cost. Airborne Sensing became one of the first 10 North American companies to offer these technologies. As its capabilities evolved, so did its fleet of aircraft. An Aztec C was purchased and briefly joined the Apache from 1983 until 1985, then a Turbo Aztec F was bought in 1987. The Apache departed in 1985, then a second Turbo Aztec F arrived in 1996. For the following decade it was a two aircraft operation. 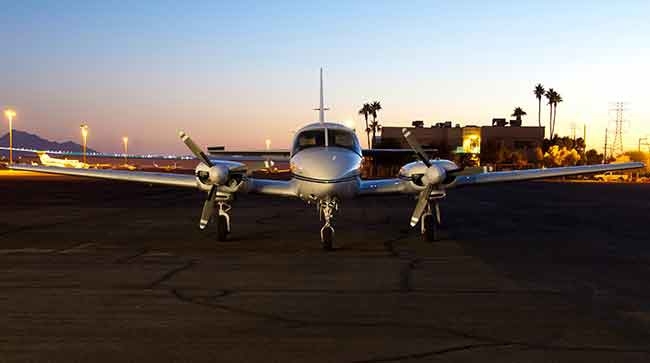 In July 2006, the company initiated a new phase of growth with the purchase of a PA-31-325 Navajo C/R. It provided greater range and increased speed – important factors for particular missions. In 2010, Airborne Sensing was awarded a significant contract in Ecuador that required a high performance aircraft. At that time, the market values of corporate turboprops were still depressed as a result of the global financial meltdown that began two years earlier. Alex Giannelia located and purchased a Rockwell 690C Jetprop Commander 840 in the U.S. The extensive modification performed to install a camera hatch in the belly of its pressurized fuselage cost more than 50 per cent of the airplane’s purchase price. The company now had a photographic platform that could operate at much greater speeds, spend far more time aloft, cruise at significantly higher altitudes and perform reliably in extremely cold conditions. The most recent fleet expansions took place when a second Navajo C/R and a third Aztec F were added in 2013 and 2015. Another move forward with respect to sensor technology occurred last year, when the company acquired an Optech GEMINI LiDAR system. Laser Imaging Detection And Ranging (LiDAR) involves aiming a laser beam down at a 90-degree angle to the landscape below. The resulting reflections enable a three dimensional measurement of the surface’s elevations. Because LiDAR “penetrates” foliage, it is able to provide extremely accurate data in heavily forested regions. Media and entertainment productions such as movies, television and online maps. The daily schedule of flight operations can vary depending on weather conditions and the nature of the work required. Aircraft typically fly between three and eight hours per day. Contracts have been as short as several minutes and as long as two years. A median flight pattern would see an aircraft fly a block of parallel lines, each about 20 to 40 kilometres long, spaced apart by 0.5 NMs. The longest that the company has ever flown in a single day is 900 NMs. The altitude flown at can be as low as 1,000 AGL and as high as FL280. Of course, the skies need to be clear for photographic work. The company’s fleet of six aircraft includes a trio of Aztecs, a pair of Navajos and the Commander 840. The three types give the company operational flexibility by allowing it to match the performance specifications of the platform with the requirements of the mission. An example of a very large contract that the company completed was the southwest Ontario Orthoimagery Project (SWOOP) in 2010. It produced high-resolution images of the lands within the province that lay west of a line running from Collingwood to Niagara Falls. During five weeks in April and May, when there was no snow on the ground or leaves on the trees, they photographed 45,572 square kilometres. Three aircraft were used to capture some 80,000 images. These photos were later used to update maps and land data banks maintained by the provincial government. The 21-member team that accomplishes these tasks is intentionally compact. Besides the president, there are eight pilots (including the chief), seven camera/sensor operators, three managers responsible for image production, geomatics engineering and client relationships and two support personnel. The company’s headquarters in downtown Toronto house the image processing facility, the dispatch centre, as well as the marketing and administrative offices. Given the level of activity in La Belle Province, an office was opened in Quebec City last April. With the increase in airline traffic at Billy Bishop Toronto City Airport, not to mention the future shutdown of Buttonville Municipal Airport, the company was forced to move its fleet 50 kilometres east to Oshawa. Don’t expect to ever see them together there. A map on the wall of Giannelia’s office is regularly updated with six markers depicting the ever-changing locations of his airplanes. Aerial photography is a competitive business that has seen many providers perish. Its key barriers to entry are capital and technical know-how. Giannelia bases his firm’s ability to win business on the quality of its work at rates that are acceptable. A winning bid must be sensitive to the client’s budget, yet it must provide a margin that enables the producer to remain afloat. Attracting and retaining talented personnel, and recognizing the importance of keeping them up to date on technological developments. North America’s landscape is constantly changing, either as a result of human activity or natural events. Therefore, a map is obsolete as soon as it has been produced. This promises to provide a market for Airborne Sensing going forward, but the competitive forces shall continue to demand the running of a tight ship. Given that he has survived three and a half decades, Capt. Giannelia and his crew should be able to avoid negative developments as long as they continue to focus on their clients.